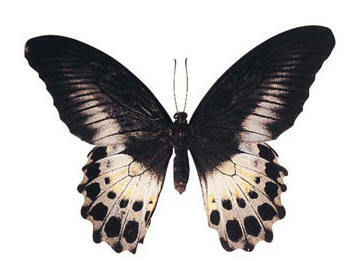 The uppersides of the males are black and bright silvery blue with distinct black oval markings on the hind wing. The females are similar, but much of the blue on the upper surface is replaced by varying grades of salmon-coloured smudges. The males are usually smaller than the females. It prefers wooded or forested habitats with open corridors and is often seen at the edges of forests. Its wing beats are somewhat slow but powerful and it stays within 15 feet above ground.